I love GNU/Linux. I have used GNU/Linux since 1999 and exclusively since 2001. I have used Ubuntu since the first version, and I depend on GNU/Linux for everything I do on a computer, whether work or play. Importantly, I use it for 100% of the work I do, and 100% of my hobbies of photography and writing. For the non-initiated that includes or has included research and research management, writing research papers, managing the information and communications technology and related areas at two big universities, a considerable number of conference presentations and public speaking engagements, operating as chief scientist for a technology company, doing a VERY large number of technical and business documents and presentations, managing my photography hobby, doing software development, playing and recording my own music, producing and recording eLearning lectures and other content. And of course, all the usual social media engagement that one does in the 21st Century. I love GNU/Linux, and I use it all the time every day whenever I have work to do on a computer. I would not trade this frictionless ecosystem for anything. Neither Windows nor Mac are remotely interesting to me, I could not live in their prisons. Still, I can point out some of the most important gaps in the GNU/Linux ecosystem. So, as Ubuntu 17.10 was recently released, I found it really hard to get excited about it, as beautiful and significant as it is as an upgrade to my preferred distribution. It is lipstick on a pig to me. I love the pig, but it is still a pig, and more lipstick does not make it a better pig. I would get really really really excited about new applications. It is great to keep improving distros such as Ubuntu, but a beautiful new distro with the same old apps is not that much of an advance, and snapping or flatpacking adds nothing to the user experience. Absolutely nothing at all. Nothing. Nix. This is the gap that commercial Linux companies need to put some energy into, and find a way to crack. An OS is its apps. And love them as much as I do, Linux apps are lagging. One of my screens. 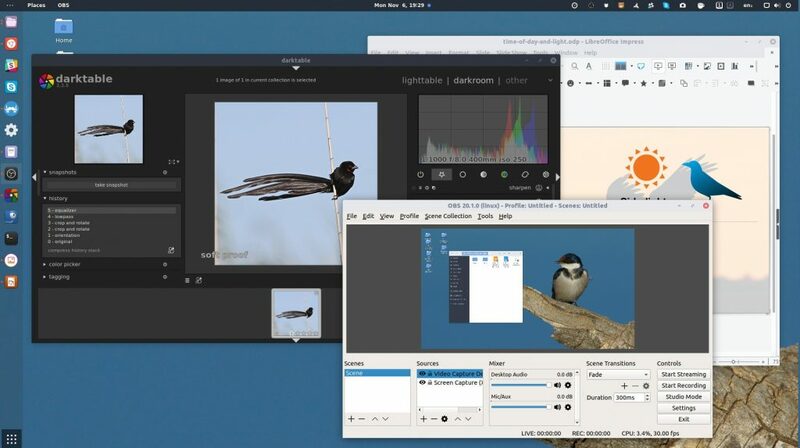 There are some great apps for Linux, but there are not enough. This would be easy to fix. Establish a body comprising the commercial Linux companies, and be creative. Apply the same creative energy that went into better drop shadows and improved icon shapes to getting better apps. I don’t have the answers, if I did I would just do it, after all we are talking about FOSS here. But it needs some energy, some creative love, and it needs some coordination to make something happen. Something for the users. Ordinary users. The only people who could pull this off, I think, are the commercial Linux companies. Better user experience is crucial to the long term sustainability of desktop Linux. Users matter.